Combo Keyboard/Video/Mouse extension Cable. Extension cable 3 in 1. VGA Male to Female, PS2 Mouse & K/B MD6 Male to Female. Length 5m. The quality of your KVM switch cables directly affects the video quality displayed on your monitor. KVM switch cables are Molded single sheath 3-in-1 cables with connectors for monitor, keyboard and mouse. Every KVM switch cable is made from high quality components and uses individual coaxial cables for each RGB signal, minimizing interference, signal degradation and ghosting. 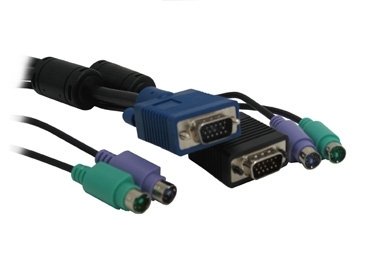 Used to extend an existing KVM cable or as a 3-in-1 Keyboard, Mouse & Monitor Extension.